It wasn’t until my first teacher training that I started looking deeper into the physiological aspects of the postures, and what the benefits are of having different classes of asana with different positive effects on the physical body. In order to build a sequence for detoxing, it’s important to look at the systems of the body that we can help detoxify, and which classes of asana target those systems. Then, all we have to do is pick a few poses from each asana group, and before you know it, you’ve got a meaningful and powerful practice to boost your body’s already boomin’ detoxing processes. So without further ado, here is a quick sequence of 7 yoga poses to help your body detox. It’s common to equate twisting postures with detoxing, and although it’s probably impossible to actually twist so much that toxins want to jump right out of your liver, any sort of compression and gentle movement in the torso definitely helps to get things moving downward and outward in the digestive system. And considering how major the role of — to put it nicely — elimination is in releasing toxins from the body, the more we help our digestive system move waste and toxins through the intestines, the better our powers of detoxing. Sit firmly on both sitz-bones with your tush behind you (rather than completely underneath you) to ensure a long spine. With the feet together, lengthen up through the crown of your head as you reach your heart forward. Take your right hand to the mat behind you, either on fingertips or with a flat palm, and hug your knees or hook your elbow to the outside of your right knee, as you twist your chest open to the right. Make sure both sitz-bones stay grounded to ensure the twist happens in the upper part of the torso and not the sacrum. Hold for at least 5 breaths, lengthening up as you inhale, and deepening the twist on the exhale. After 5 breaths, switch sides. For this mega twist, first start in Chair Pose, making sure your big toes are together and you can see your toes in front of your knees. Take your hands to Anjali (namaste) mudra at your heart center, and hook your left elbow to the outside of the right thigh as you twist open to the right. Keep your knees in line, and press strongly into your palms to deepen the twist, unfurling your chest up and open to meet your thumbs as you roll your right shoulder away from the right ear. After 5 breaths, come back to center. Switch sides. Have you ever seen a mama cat licking her baby’s tummy to help it digest? Well, instead of asking our partners or friends to lick our bellies to get our digestive fires burning, let's just help ourselves, shall we? Compression and pressure on the abdomen is what we are going for in Forward Folds, and adding a mini-massage with our fists is a great way to help get things moving. Stand with your feet hip distance apart and take your fists to your hip creases. Keep the spine long and strong as you fold forward over bent or straight legs, letting the back body completely release and the head and neck hang heavy without effort. If you don’t feel pressure from your fists in your belly, bend your legs enough so that your belly rests on your thighs, with the fists gently compressing the lower abdomen. Then make small circles with the fists to gently get movement in the intestines to help your body release waste and toxins from the digestive tract. Stay here for 5 or more breaths before coming back up to Tadasana, Mountain Pose. 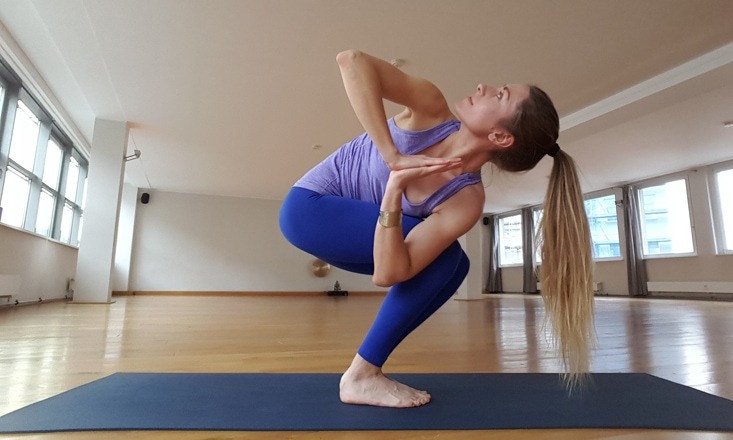 This pose, along with other belly-down heart-openers, is great at compressing the intestines and is one of my favorite poses when I’m feeling bloated and sluggish. Take a blanket or towel and make a tight roll with it so that it’s at least the width of your body or longer. Then place it around the middle of your mat so that when you come onto your belly for Sphinx Pose, the blanket will be right underneath your belly button. Take your forearms out in front of you, with your shoulders directly over your elbows and your palms on the floor. Press your toenails into the mat as you send your heart forward, making length in the spine. Close your eyes and take at least 5 deep breaths, letting the blanket work a mini-miracle on your digestive system as you send your breath down into your belly. After a few breaths, move the blanket roll down a few inches towards your pubic bone and repeat. Inversions are highly beneficial to our bodies in so many different ways, but are sometimes hard to access if we are new to the practice. Three-Legged Downward Facing Dog is a great pose to get your blood circulating and decrease stagnation, sending fresh blood and lymphatic fluid throughout your entire body. Start in Downward Dog, with a solid foundation of hands shoulder-distance apart with fingers spread wide, and feet hip-distance apart. On an inhale, press strongly into your hands as you float your right heel back and up behind you. Keep your shoulders squared to the front of the mat and press into your hands to lengthen your entire body, from your fingers out through both of your heels. Stay here for 5 breaths before switching sides. Another great inversion for beginner to advanced yogis that doubles as a Forward Fold. Step your feet about one leg-length apart and make sure the outer edges of your feet are parallel to the edge of the mat. Put your hands on your hips and as you inhale, and reach skywards with the crown of your head. On the exhale, keep the back long and strong as you fold forward, either keep the hands on the hips, place them under your shoulders on the mat, or on blocks. Stay here, or begin to walk the hands back so that the fingertips line up with the toes and bend your elbows, stacking them over your wrists. Relax and release the entire back body while keeping the kneecaps lifting to stabilize your foundation. Stay for 5 breaths, then take your hands back to your hips to come up out of the pose with a long spine. This luxurious restorative pose can be used as both an inversion and a time to slow your breath and calm the mind. Learning to breathe deep and increase lung capacity is important not only in maximizing oxygen intake to every cell and tissue of the body, but it also affects our stress levels in a very positive way. And when our stress levels go down, all systems of the body — physical, emotional, and energetic — are better equipped to work in perfect harmony to create the best version of yourself possible. A bolster, pillow, or blanket under your sacrum in this pose will increase the inversion and allow you to fully relax in the pose. Put one edge of your folded-up blanket right up against an empty wall-space. Sit sideways along the wall so that your right shoulder and right leg are touching the wall. As if you want to sit on the wall, put the right side of your bottom up on the wall as much as you can so that the sitz-bones are in contact with the wall. Keep this contact as you swing your legs up the wall and recline into a comfy position. You can take your legs out wide, or keep your feet relaxed and pointed straight up towards the clouds, your choice. Close your eyes and take one hand to your belly and one to your heart and bring your awareness to your breath. Follow your breath for a few rounds before starting to deepen it, by using a counted inhale and exhale technique. Take a deep inhale through your nose into the bottom of your lungs for 5 counts. Hold the breath in your throat for 5 counts, then slowly exhale it out the nose for 5 counts. Repeat this breathing exercise for as long as you have time, allowing your body to be effortless and your mind to calm. Try out this sequence for yourself, and let us know how it goes in the comments below!